I just downloaded many MKV files from the internet and found they had Japanese subtitles. Now I need to put subtitles in my own languages into them. I searched for and tested many kinds of possible ways. Disappointedly, the tool they recommended like MKVtoolsnix was very complicated to use. And I couldn’t find output file with removed subtitles by VLC. How can I remove subtitles from MKV? I am very grateful for any of your advice. Video Converter Studio is a very professional converter which provides you the ability to convert videos in MP4, AVI, 3GP, WMV, ASF, VOB, OGV, etc to any popular video or audio format. It can not only help you convert video files with high quality but also specify the video parameters such as bitrate, sample rate, frame rate, channels and so on before converting. Even better, it is updated continually to support the latest video parameters so that you can use it to convert files for your newly purchased devices. For example, you are allowed to convert video to 60fps via it. It also offers you many video editing functions. You can use it to trim, crop, rotate, adjust volume, contrast, saturation, etc. Unlike other powerful programs, it is super easy to use. Simply follow the guide to remove subs from MKV. Hit the Download button to download and install the program on your PC. Load your file by hitting “Add files” button. After loading your file to its interface, you can see the video thumbnail on the left. Once you tap the subtitle drop-down menu, you can see subtitle track, none and add subtitle options. Hit “None” option to remove all unwanted subtitle tracks from your video. Choose the output format from “Profile” option. And hit the big blue “Convert” button to trigger it. 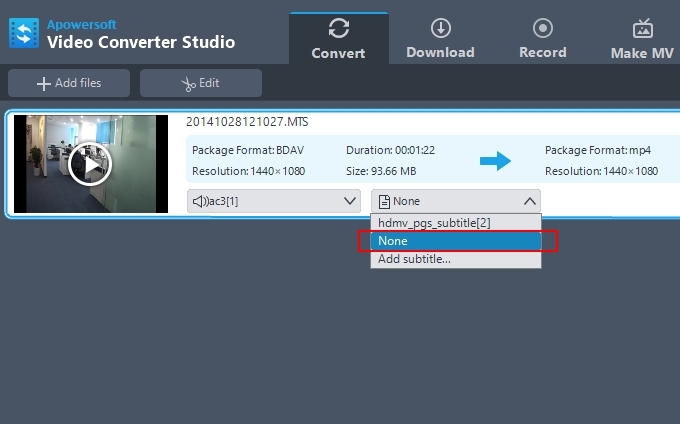 As you can see, it is easy to remove subtitle track from MKV by using this program. Moreover, it has the ability to download videos from the most famous video sharing sites – YouTube, Dailymotion, Facebook, Vevo, Vimeo, Metacafe, Yahoo and millions more. The tool features a MV maker that allows you to make memorable MV in regard to wedding, baby’s birthday party, travel, etc. Handbrake, whose icon is made up of a drink and a pineapple, is an open source, multiplatform video transcoder. It was developed by Eric Petit in 2003 and has been gone through many revisions. It can be used to rip and convert video files to play on a number of devices. Before converting, you can specify output characteristics including aspect ratio, video codec, frame rate, audio track and subtitle. If you are the first-time user, you may find it not very intuitive to use. Search for it via Google and then download it onto your computer. Run it, and hit “Source” option, select “File” in the drop-down menu. Select the file you need to remove subtitle. Hit “Browse” button under Destination to set the output file. Hit “Subtitles” tab and “Clear” button. Go to hit “Start” button next to Source. After converting, you can find the output file from the Destination. 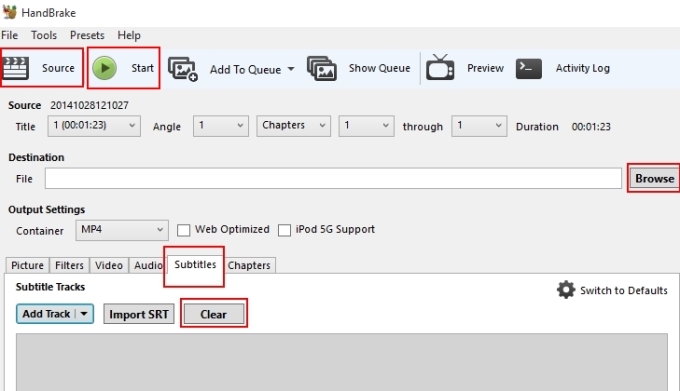 Tips: Handbrake can only output video in MP4 and MKV formats. If you need to convert videos to other kinds of formats, you can go to use Video Converter Studio. 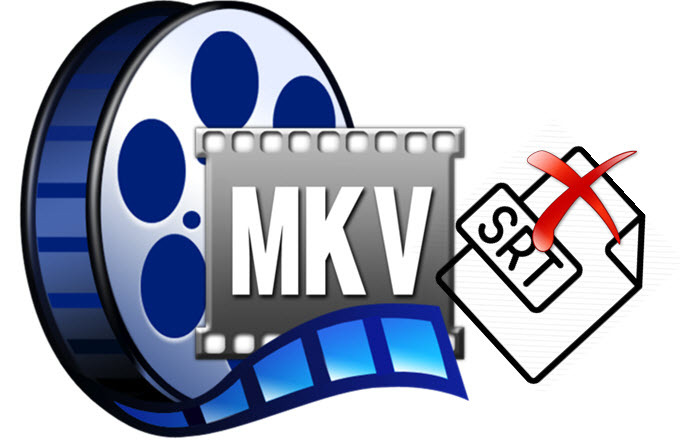 Video Converter Studio is the top choice of MKV subtitle remover because it can finish task faster. And its additional functions can help you do many other jobs very easily. However, Handbrake seems to be a little inferior for its rough interface and complicated functions. In general, the shot videos and distributed movies formally have separated subtitles. That is to say, the video and subtitle tracks are soft coded together. The two tools shared above can assist you in removing soft coded or embedded subtitles well. However, if you use them to add subtitle to video and then convert it, the video and subtitle will be integrated into each other. In this case, you cannot remove the added subtitles with the tools.